New 2013 Maruti Wagon R Vs Old Maruti Wagon R 2010 Model–What Is New? 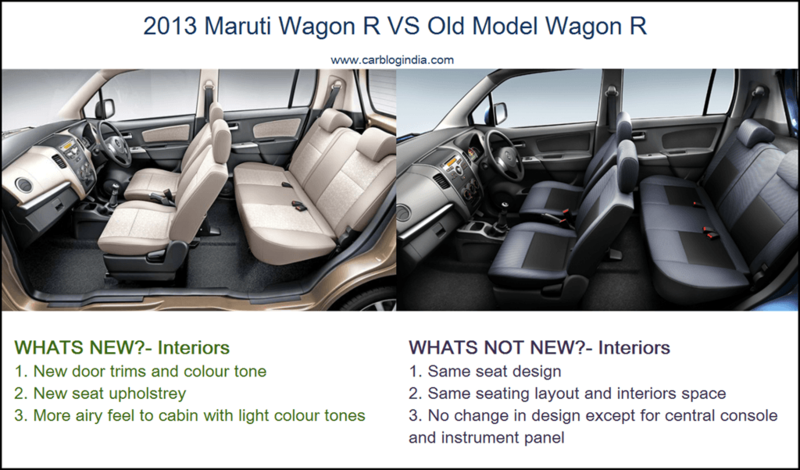 Maruti Suzuki India has introduces new Maruti Wagon R 2013 with minor facelifts. The facelift on the new Wagon R is somewhat like we have seen on the new Ritz which got minor uplifts on the front and interiors. Same is the story with the new Wagon R 2013 new model which launches in January 2013. 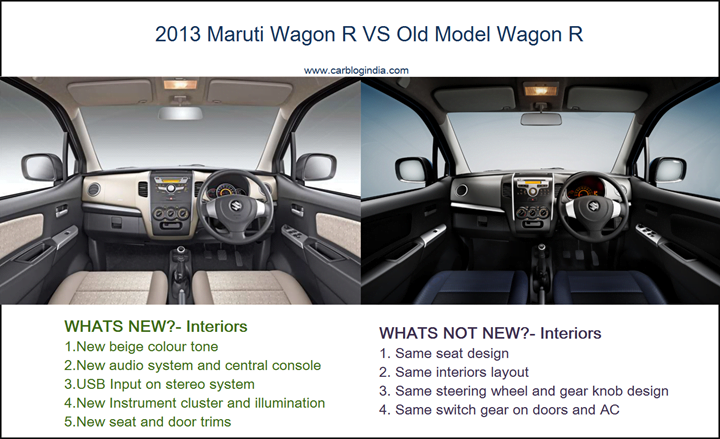 In this article, we compare what all changes have been made to the new 2013 Maruti Wagon R VS Old Maruti Wagon R 2010 model. Starting with the front, which gets most changes, there is a pronounced difference in the area just below the bonnet. The chrome strip just above the grille is not thicker giving it a more premium look. The main grille and slats have become sleeker giving it a sharp face. The air dams below the grille has become larger and is now a very pronounced inverted trapezoidal shape. There is also a downward flow contours just below the headlamps on both sides. 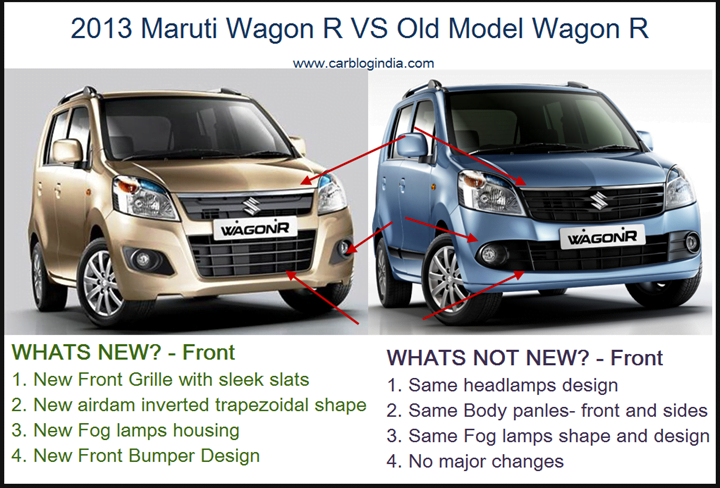 The fog lamps housings have also been redesigned in a smart looking rhombus like shape but the headlamps and the fog lamps remain the same, which is a smart move as it will save a lot of cost to Maruti Suzuki as well as the spare parts and supply chain network for Maruti. There are two new body colours introduces with the new 2013 Wagon R, these are- Passion Red and Ecru Beige. The interiors also get a breath of fresh air with a better looking light tone interiors in beige and grey which make it looks somewhat premium than before. But the beige interiors will be offered only on Vxi trims and not on the lower variants. There is new seat upholstery and door trims as per the new color theme, the dashboard design also remains the same largely with minor changes in the central console which gets a new design stereo system which now comes with in-built USB audio support. The illumination and design of the the instrument cluster has also been refreshed in the new model. There is a small storage compartment added on top of the central console for storing small stuff which can come in handy. Also there is a day-night inside rear view mirror added to the new Wagon R.
The seats design and layout remains same and so does the storage and cubby holes inside the car. The intelligent re-use of most of the interior components and design is quite prominent which saves a lot of investment for a facelift. The engine and fuel options which include Petrol, Petrol+CNG and Petrol+LPG remain the same. But the engine tuning or mapping seems to have undergone improvements. The new 2013 Wagon R is more fuel efficient (by 8%) compared to the older model as per Maruti Suzuki. The transmission uses a lower viscosity gear oil in the new Wagon R and the engine has some friction reduction technologies which help improved the mileage. There is also some improvement in the breathing of engine which helps improve overall economy. This minor facelift, is expected to improve the sales number for Maruti Suzuki India. For long time we have been hearing rumors and also some official statements on a small car with Diesel engine from Maruti, but 2013 Maruti Wagon R with Diesel engine is quite unlikely as of now, but we can not deny the possibility of the same in future as Maruti would definitely like to fit a diesel engine in its small cars.